The President of the United States has announced that he is proud of the fact that Kanye West supports him, is loyal to him and is not afraid to inform the world of that fact. After the Republican’s surprising win in 2016, many celebrities were quite vocal in their dislike for the country’s president. Kanye, on the other hand, spoke out in favor of the controversial politician several times. The rapper has also been photographed wearing a red baseball cap that reads Make America Great Again which is the slogan used by Trump supporters on social media. Recently, it has also come to light that the rapper was invited to join the former businessman for lunch at the White House on Thursday, 11th of October 2018. Before their meeting, Donald Trump spoke about Kanye in an interview confessing that to him, the artist is no less than a genius. 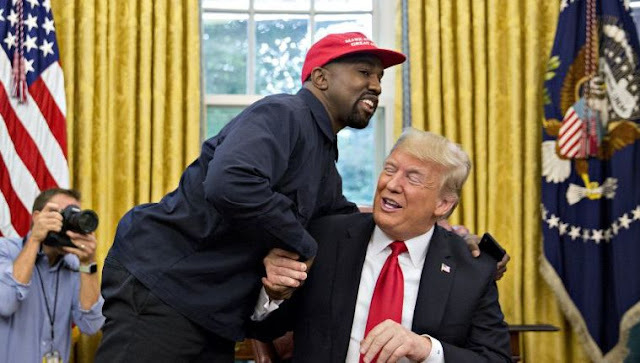 The Republican also shared that ever since Kanye voiced out his support for him, the number of African-American supporters that he has, have gone up. According to Donald Trump, his support from the African-American community has seen an increase of 25 percent. Kanye’s visit to the White House was supposed to include a lunch with the President himself, his son-in-law Jared Kushner who is also his political advisor. The three of them were going to discuss a few economic and social issues. However, before Kanye’s arrival, Donald Trump had already signed the Music Modernization Act for the year 2018. Several other celebrities like Kid Rock and John Rich had been present to witness the former businessman sign the act that contains the laws, according to which, singers and songwriters will now be able to earn more from streaming services and be paid for recordings made prior to 1972. This lunch was the second time that the rapper has met up with Donald Trump ever since he won the office back in 2016. Because Kanye was unable to be present when the Republican won the elections, he showed his support openly by visiting the Trump Tower that is situated in New York in the December of 2016.